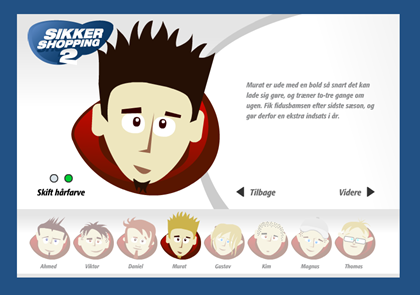 Safe Shopping game for teens _ Mathias Vestergaard Corp.
Sikker Shopping (“Safe Shopping”) is an online education system that helps teenagers become better shoppers. The system is built around a story frame where the user must first chose a cyber friend. Tests amongst users have shown, that this first seemingly unimportant step is extremely important for the user’s feeling of being involved in what happens (the selection of a cyber friend). After choosing and customizing a cyber friend, the user can proceed to actual game. In this part, the user is presented with quizzes of varying length. Each quiz rewards the user with an appropriate score depending on the correctnes of the answers. Chosing the right cyber friend is extremely important to the teenage users. The quizzes incorporate text, images and video and the cyber friend is always around to assist. The sytem was designed by Warnich IT. The short ,ovies were produced by Puste Grise Op Productions. Most of the technical implementations of the quiz module wer conducted by me.